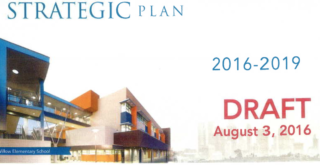 LAUSD Superintendent Michelle King’s strategic plan. Superintendent Michelle King will present her strategic plan for LA Unified to the school board on Tuesday, a 16-page document outlining three years’ worth of goals and expected improvements but lacking specific details on how to accomplish them. This is the draft of a long-anticipated plan that is supposed to address academic improvements and budget concerns in a roadmap that King said she has been working on since she was first appointed to the position in January. The board members may not be happy with the single-digit percentage increase goals if Tuesday is anything like a committee meeting two weeks ago where board members skewered an upbeat report on improvements. That report was made by King’s chief academic officer, Frances Gipson. The elder statesmen of the board, George McKenna, Richard Vladovic and Scott Schmerelson — who had all been LA Unified teachers and principals — expressed dissatisfaction with the district’s test scores and called them “frustrating,” “depressing” and “disappointing,” despite the reported improvements. For the 2016-17 school year, King is proposing a 5 percentage point increase in math scores, from 28 percent meeting or exceeding standards this year, to 33 percent. In English, she hopes for a 4 percentage point increase to 43 percent from 39 percent meeting or exceeding standards. For each of the following two years, the goal is to increase both math and English scores by 2 percentage points each year. In a breakdown of the 10 largest school districts in the state, the California Department of Education’s scores of the 2016 California Assessment of Student Performance and Progress (CAASPP) tests show there’s still much improvement needed. LA Unified ranked 4th among the largest 10 school districts for improvement, and most of the other districts have at least a score of 40 percent in one or both of the tests. While the plan does not address the district’s significant problem of declining enrollment specifically, among the stated highlights of the plan is a 24 percent increase in magnet, Linked Learning, dual-language, STEM and STEAM programs, as well as a 30 percent decrease in chronic absenteeism. Other main goals are 100 percent of schools providing arts education and restorative justice programs. King also wants every parent to have access to a Parent Access Support System Portal (PASSport) by the end of the year so parents can monitor students’ grades. The district’s impending deep deficits were also not specifically addressed. King noted in the introduction that the plan had input compiled from 68 meetings attended by 2,655 people including teachers, parents, students, civic leaders, employees, board members and community and labor partners. The ultimate goal for graduation rates is 100 percent. King’s report said they have yet to set a goal of how many students they want to be concurrently enrolled in at least one community college class. They also have yet to set a goal of the desired percentage of graduates who are bilingual and bi-literate. In a striking similarity among many of the stated benchmarks in the strategic plan, King is calling for increases of 2 percentage points per year. For example, the percent of English learner students who reclassify as fluent English proficient should increase to 20 percent in 2016-17, to 22 percent in 2017-18 and to 24 percent by the end of the 2018-19 school year. The plan calls for the percentage of students getting a C grade in their required A-G courses to rise from 42 percent this year to 48 percent in 2016-17, 50 percent in 2017-18 and 52 percent by 2018-19. The percentage of students passing the Advanced Placement exams is to rise to 40 percent next year, 42 percent the following year and 44 percent the third year. In other areas, benchmarks are decreasing by 2 percentage points per year, such as for English learners who have not been reclassified in five years. In 2016-17 it calls for 19 percent, dropping to 17 percent in 2017-18 and to 15 percent in 2018-19. Chronic absences are to drop to 11 percent in 2016-17, to 9 percent in 2017-18 then to 7 percent in 2018-19. Days lost to suspensions are to decrease from 6,097 to 5,036 by 2018-19. King’s plan also talks about getting parents and the community more involved in education, providing safer schools and continuing to support the whole child with health centers, mental health clinics and other services. Other goals include developing “collaborative district partnerships” and “streamlining processes will lead to expanding school-driven partnerships.” School and staff members are to “promote the value of an LA Unified education” by handing out fact sheets, brochures and flyers at schools and training staff to communicate about district accomplishments and success stories. One item under “tools and resources for success” is “financial incentives for schools,” with no further details. New York City schools experimented with schoolwide performance bonuses, but they were discontinued in 2011 after three years. The school board members will be able to ask questions at Tuesday’s meeting. There will also be time for public comment. The plan will be presented Tuesday to the Committee of the Whole, which is made up of all seven board members and is supposed to offer a forum for deep-dive reports that would take too long during the already lengthy monthly board meetings. This meeting is scheduled to be held at the USC Caruso Catholic Center at 844 W. 32nd St. at 9:30 Tuesday and is open to the public.